Kwame Alexander’s novel in verse was included on several Best of 2014 lists, but it was Maureen’s post that landed it firmly on my radar (it’s clear to me by now that we have similar enough taste than when she really loves something, I should pay attention). The Crossover is about Josh, also known as Filthy McNasty. Along with his twin brother JB, he’s the star of his school’s basketball team, and the two dream of following in their father’s footsteps as professional players. In these first person poems, Josh talks about his relationship with his twin, his insecurity when his brother gets a girlfriend, his love for the game he plays, the complications of growing up, and his father’s declining health. The most striking thing about The Crossover is how well it uses its form. Last year I read and enjoyed other narratives told in verse, like Inside Out and Back Again and Brown Girl Dreaming; while I found them well-written and enjoyed the poetry, I mostly loved them for the story they told, rather than for the how of the telling. 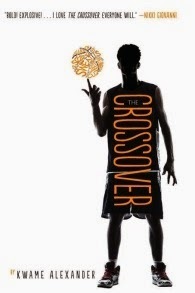 The Crossover is different: it’s bold, it’s inventive, and it pushes the boundaries of narrative verse with great success. Alexander plays with font size, text arrangement and other visual poetry techniques in ways that never feel gimmicky or gratuitous — instead, they do an amazing job of bringing the poems’ emotional core to life. I count Franny Billingsley among my favourite authors solely on the strength of her second and third novels, The Folk Keeper and Chime; I’ve been saving her first, Well Wished, for a time when I needed a treat. The fact that this is her debut does show, which isn’t to say it isn’t filled with lovely writing and still worth reading. I’ve seen Well Wished compared to Frances Hardinge’s Verdigris Deep a number of times, and now that I’ve read both I understand why. They’re both novels about magical wells whose wishes backfire, and, more importantly than that, both use this premise to explore themes of power and vulnerability and what it’s like to be able to significantly change someone’s life, sometimes as a by-product of getting what you want. There’s no way around the fact that Well Wished portrays disability in uncomfortable and stereotypical ways. Catty, our protagonist Nuria’s best friend, is unable to walk, and the narrative frames her disability both as a magical punishment and as an obstacle that has to be removed before she has a chance at happiness. This removal (spoiler ahoy) occurs again by the means of magic — a storytelling device that has been examined and critiqued by people far more knowledgeable than I am, and which adds to a pattern we could all do without. I spent the whole of Well Wished hoping the story wasn’t going in that direction, but alas. Catty’s tongue was different. It shrank away at the taste of salt, and now she couldn’t find that place where sharp cheese explodes with a wonderful ping! It was the kind of dismal, freezing weather that followed a thaw, with no new snow to hide the raw and dirty ground. When the wind blew, the icy branches rubbed their hands together, making the whoosh and roar she’d thought was the sea. Also, Well Wished is set in the period between Christmas and Twelfth Night, and it captures the mood of the days surrounding midwinter better than anything I’ve read since The Dark is Rising. These are not words I say lightly: Billingsley has created an absolute masterpiece of atmosphere. This is exactly what Fanny Billingsley invites us to imagine in Well Wished, and I love that. My glorious resolution to binge on Diana Wynne Jones in 2015 encouraged me to pick up the three Chrestomanci books I had left, and I soon realised I like this series far more than I remembered. Not that I ever thought I didn’t like it — it’s just that, as time passed, I came to misinterpret what “These are not my favourite DWJs” actually means. As it turns out, it doesn’t mean “They’re not that great”; it means “She has even better books because she was a genius, but these are still pretty wonderful”. So I spent the first few weeks of the year rediscovering the Chrestomanci series and basking in how warm and funny these books are. 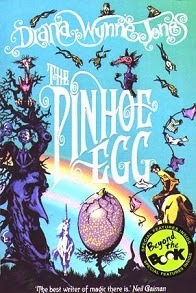 I liked Conrad’s Fate the best of all three, but The Pinhoe Egg is the one I feel compelled to write about. I also liked it a lot, but in a more complicated sort of way. I loved Marianne, I loved Nutcase, I loved spending more time with Cat, and I loved what came out of the egg. I loved exploring the world around Chrestomanci castle — the magical forests, the witch families and ancient feuds, the several layers of secrets that are slowly unveiled. However, I was slightly thrown off by the fact that I turned out to be reading a very different book than the one I initially thought I was. Please bear with me as I attempt to explain what I mean by that. Grammer Pinhoe is a character who has a lot in common with Aunt Maria from Black Maria, but it actually took me a while to recognise her as such. So I read the early chapters of The Pinhoe Egg as a funny but nevertheless touching account of the indignities of old age and illness and the disempowerment that accompanies them. As the story progressed, it became clear that this reading didn’t fit the bigger picture of the narrative, but part of me was too attached to it to let go easily. I wanted Gammer to have been less in the wrong; I wanted her family making decisions on her behalf and her attempts to resist this to have meant something other than what it did in the end; I wanted different dynamics between her and Gaffer; I wanted to be fonder of her than the narrative gave readers any reason to be. Another thing I wanted was for the anti-authoritarian streak I initially perceived in the novel not to have been undermined by the ending. I hoped there would be more to why the Pinhoes and the Farleighs hid from Chrestomanci, and I wanted them not to have turned out to be like misbehaved children who were once again unambiguously in the wrong. The resolution of the feud between the Pinhoes and the Farleighs was more conservative than I expected, and in many ways it was at odds with the rest of the book. Chrestomanci’s intervention had echoes of uncomfortable ideas about benevolent authority taking power away from people “for their own good”, it seemed to me, and it erased the possibility that they might shy away from close scrutiny by a government agent for legitimate reasons. I suppose that in my head, the Pinhoes and the Farleighs were like Discworld’s witches of Lancre, who operate outside a system that has always excluded them, and Chrestomanci like the Wizards of Unseen University — often well-meaning, but still aligned with traditional authority and not always understanding towards those who don’t fit the mould. This comparison is perhaps a bit simplistic and not necessarily apt or fair, but the Discworld power model is closer to my sensibilities and thus easier for me to feel at home in. In The Pinhoe Egg, Chrestomanci’s intervention makes perfect sense in light of the two families’ misuse of magic and abuse of power, but this is very much the kind of narrative I tend to be suspicious of. Not wanting to be scrutinised isn’t always a sign that one has something to hide, self-ruling doesn’t inevitably end disastrously, and I’d like to see more stories that acknowledge these facts. On the other hand, the novel is also about questioning authority and challenging stifling and senseless traditions — it was wonderful to see Marianne gain confidence, stand up to the adults around her, and slowly begin to feel at home with her own power. The fact that I couldn’t always reconcile these two strands of the narrative means my fondness for The Pinhoe Egg is complicated, but it’s there nonetheless. I found this novel immensely pleasurable, I greatly enjoyed getting to know its characters, I’m heartbroken we won’t get to read about Klartch again, and I’ll never, ever stop wishing Diana Wynne Jones was still around writing new books. I really want to branch out and read some novels in verse this year. I don't know why I have a resistance to the form -- maybe it's a "why can't they just tell the story?" reaction. I'm never fond of experimentation for its own sake. But I should give them a chance at least. Yes, please do! I don't think you'll regret it. None of the experimentation in The Crossover felt like it was there for its own sake. It enhanced what the poems were saying and made them all the more powerful. Lucky for me you're not the type of person who discards her friends because they don't make smarter choices. How is it that I *still* haven't read Diana Wynne Jones?!! And just how many times have I said that in the past. *sigh* Okay, I am firmly declaring right now: This is the year I will finally read Diana Wynne Jones! I will *not* fail!!! Well, it's true that I'm not, but this isn't about smart choices anyway - it's about too many appealing stories and too little time :P Having said that, please do read her! 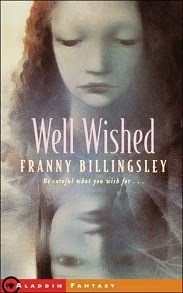 Yeah, Well Wished is not nearly as good as Franny Billingsley's second and third books, for a lot of reasons. Though I suppose Chime is so nearly a perfect book that it would be very difficult for anything else to live up to it. Oh Chime. I need to reread Chime. I totally hadn't made the Grammer/Aunt Maria connection but YES. The strange thing is that an outsider might cast Diana herself into the role of the matriarch witch because she's, like, the magical boss of all things, when she is actually the Marianne or the Mig, right? She was and is and always will be the best. When I think back on Reflections, I think I understand why she was prone to writing that kind of threatening matriarch character. There are hints in the books too, when she talks about characters being managed and how awful that is. I think it's important to acknowledge that parental figures, or figures of authority in general, aren't always benevolent and don't have other people's best interests at heart, even if they claim they do. I love how her stories acknowledge that. Yet at the same time, I was hoping The Pinhoe Egg would go in a different direction and Grammer turned out to be somebody I could like. Conrad's Fate is my favourite of the series too, Christopher Chant is just at too charming an age then. I loved "what came out of the egg" too. It never would have occurred to me to draw an analogy between the Lancre witches and these, but now that you've said it, it makes sense. I need to reread this book. Love your blog! I saw The Crossover at the library, but didn't pick it up. I didn't realize it was a novel in verse. It caught my eye because I'm a big fan of basketball. Seems like one that would be much better read in its physical format than on audiobook - I'll look out for it again!